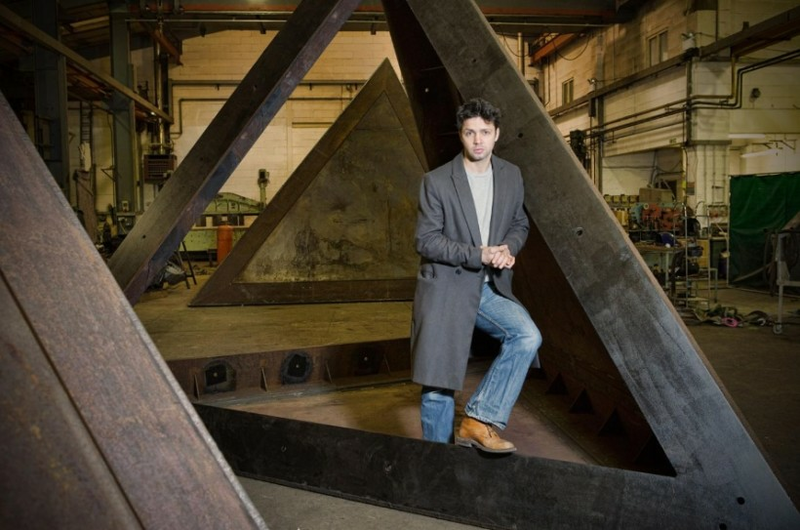 Maths and science are the inspiration for Conrad Shawcross’s poetic metal sculptures, not least the towering work unveiled at King’s Cross next week, he tells Ben Luke. In a vast warehouse in Dagenham a remarkable sculpture is taking shape — Conrad Shawcross’s Paradigm, which, weather permitting, will be erected next week outside the Francis Crick Institute, the new biomedical research building next to St Pancras station. This steel tower, formed from a succession of tetrahedrons that grow in size as they stretch into the sky, will stand 14m tall and 5m wide at its summit. When I see it, accompanying Shawcross on his latest visit to Benson-Sedgwick, the Essex engineering company that is constructing it, the sculpture is still in pieces, albeit large and impressive ones.